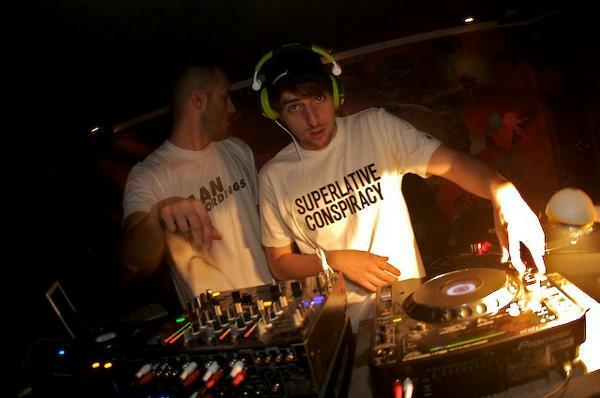 Tom Findlay y Andy Cato son Groove Armada, dos tíos de Cambrigde, que se mudaron a Londres para triunfar como dj’s. Transmiten energía para lograr que el público se mueva con sus beats. Llevan más de diez años encandilando a la gente con temas como “I see you baby”, popularizado por Fatboy Slim, o “If everybody looked the same” anuncio de Mercedes Benz en el 91. Empezaron desde cero: primero pinchaban en pequeños locales, y más tarde fundaron un club, bautizado como Groove Armada, nombre de un festival de música de Newcastle de los 70. Allí cada uno ponía su música por separado, house, funky; pero decidieron cambiar de local y sus dos estilos se tuvieron que fusionar, creándose una aleación perfecta, que continúa teniendo éxito hasta hoy en día. Prueba de que siguen sabiendo adaptarse al mundo disco, es su residencia veraniega en Space ,Ibiza, y su residencia anual en Fabric en Londres, cuna de la música electrónica inglesa. House, ska, funky, techno, rock y pop son sus géneros; mezclados han acuñado un sonido inconfundible, relajante, ambiente,…tan bueno para bailar como para escuchar. Con más de 3 millones de álbunes vendidos en todo el mundo, más de 5 millones de personas que les han visto en directo y muchas nominaciones a los Brit y a los Grammy, ellos han vuelto con su último trabajo “Black light” (2010), dejando claro que siguen en plena forma. Este disco que viene después de “Sound Boy Rock” (2007), padre de canciones como “Get down”, o “Love sweet sound”, se ha realizado con colaboraciones como Bryan Ferry de Roxy Music, el grupo Empire of the Sun, o el artista pop Will Young. Tenemos Groove sound para aburrir. 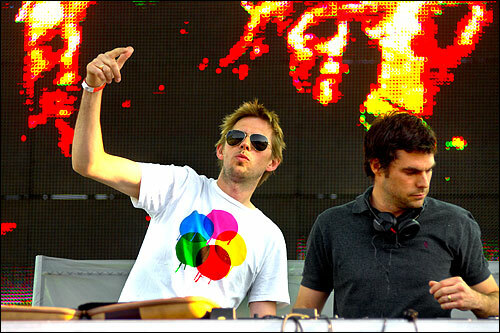 Tom Findlay and Andy Cato are Groove Armada, two guys from Cambridge, who moved to London to succeed as a dj’s. Transmit power to ensure the audience will move with his beats. They have been over ten years dazzling people, with songs like “I see you baby“, popularized by Fatboy Slim, or “If Everybody Looked the same” Mercedes Benz’ ad at 91. They started from scratch: first played in small clubs, later founded a club named Groove Armada, name of a Newcastle’ music festival in the 70’s. They each put their music separately, house, funk, etc, but decided to change local and these two styles needed to merge, creating a perfect alloy, which continues to be successful until these times. Evidence that they still can adapt to the disco world, is their summer residency at Space, Ibiza, and their annual residency at Fabric in London, home of the British electronic music. House, ska, funky, techno, rock and pop are their genders; and mixed have coined a unique sound, relaxed, so nice to dance as to listen. 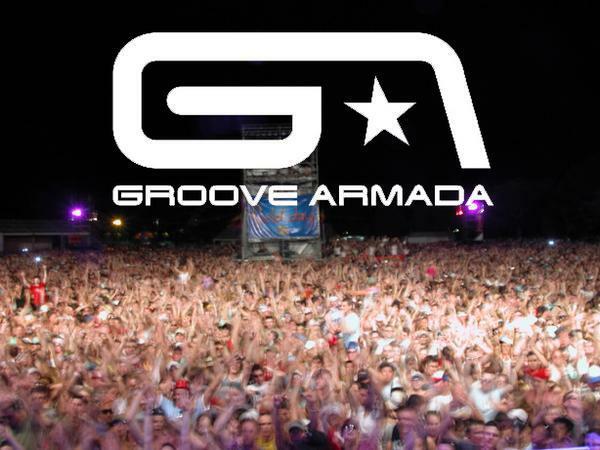 With over three million albums sold worldwide, an estimated five million people who have seen them live, and multiple Grammy and Brit Award nominations, Groove Armada are back with their new work, ”Black Light” (2010) telling us that they are fit. This album, comes after “Sound Boy Rock” (2007), father of songs as “Get Down” or “Love Sweet Sound”, has been done with collaborations like vocalist Bryan Ferry from Roxy Music, Empire of the Sun, UK pop star Will Young. We have Groove sound to get bored. Bueno, como ya os dije al principio, no queriamos que el blog fuese únicamente de música electrónica. El siguiente video, que me pasó Richie Jaunting ayer, une dos de nuestras más grandes pasiones: El Surf y la música. Es Marten Persiel quien dirige este corto, patrocinado por una importante marca de cervezas, en el cual se juntan durante dos días a un grupo de surferos con un grupo de música: We are Standard. El resultado se puede apreciar en el video, el buen rollo y la amistad que surge entre los participantes. A We are Standard (Deu Txakartegi, Jon Aguirrezabalaga, Javi Leta, D.W. Farringdon, Juan Escribano) les he visto ya varias veces. La primera vez, en Benicassim, el año pasado. Su concierto fue genial, hasta tal punto de que le recuerdo como uno de los mejores, quizás a la altura de Oasis, 2 Many Djs, Maximo Park, White Lies, Naive New Beaters o Steve Aoki, todos ellos me parecieron grande conciertos. Precisamente fue éste Festival, Benicassim, el que les catapultó a la fama en el año 2005 gracias al proyecto Demo, y el que consiguio que Mushroom Pillow se fijara en ellos y fuera la compañía con la que grabaran su primer disco: 3.000 V 40.000 W, y al que siguió después We are Standard. Les volví a ver unos meses después (Enero 2010) en Madrid, en la Sala Heineken, cuando supe que iban, no lo dudé… de cabeza… geniales de nuevo. Por último, les ví también en el SOS 4.8 de Murcia, en Abril, y volvieron a demostrar que no solo son un gran grupo sino que sus directos son, si cabe, aún mejores. Su música se puede calificar de Indie-rock, o incluso de funk-punk-rock. Aunque la verdad es que introducen muchos sonidos cercanos a lo electrónico que les acercaría un poco más al genero dance-club. En resumen, es un grupo que hace música diferente pero bestialmente buena. Os lo recomiendo muchísimo. Además son de aqui, son de Gecho, un pueblo de Vizcaya donde también es importante el deporte del surf. Os dejo con el video, y con algunas canciones del grupo. Espero que, pese a salirse de lo habitual en la página, me digais que os gusta el estilo. Well, as we said at the beggining of the blog, we wouldn´t want to write only about electro music. The next video, that Richie Jaunting passed me yesterday, combine two of our big passions: Surf and Music. Marten Persiel is the director of this short movie, sponsored by one famous company of beer, in which a group of surfers get together to a music band (We are Standard) for two days. We can see the good vibes and positive energy that they have as the result of the experience. I have seen We are Standard (Deu Txakartegi, Jon Aguirrezabalaga, Javi Leta, D.W. Farringdon, Juan Escribano) several times. The first time was last year in Benicassim. His show was amazing, to such a point that now I remember it as one of the best, maybe on a par with Oasis, 2 many Djs, Maximo Park, White Lies, Naive New Beaters or Steve Aoki, all of them exceptionals. Just this Festival was the one who propelled them to stardom, with their “every-year” Demo Proyect. This make the Mushroom Pillow Records noticed them and signed up their first album: 3.000 V 40.000 W, followed by “We are Standard”. I saw them some months later (January 2010) in Madrid, in “Sala Heineken”, when I heard of it, I didn´t doubt my attendance,… headfist, and they were brilliant again. Finally, I saw them at S.O.S. 4.8 Festival in Murcia, this april. And they demostrated again that they are not only a great group but also they are amazing in their live shows,… they are even better in their live shows. Their music is Indie-rock, but it can also be Funk-Punk-Rock. They usually introduce electronic sounds in their songs that can bring their style closer to the dance-club genre, even to electro music. In summary they are a band who make diferent music but incredibly good music. I recommend them too much. They are also from here, from Gecho, a town of Vizcaya here in Spain, where surf is also very important. I finish with the short and with some song of the band. I hope that, even it is not the norm of the blog, you said you liked it. ¿Qué deciros de Crookers, que no se sepa?…Nos encontramos en el estallido del electro burro, comienzos del género tecktonik en Francia, e inicio del boom de la moda de la gorra de visera plana entre los no-raperos. Es allí, cuando este dúo de milaneses comenzaron a ser mundialmente conocidos. Os los presento, si no los conocéis; ellos son Phra y Bot. Ambos empezaron muy pequeños a tocar la guitarra, y ya en su entrada adolescencia se decantaron por los “synths”. Phra, comenzó en la escena del hip-hop italiano cuando tan solo tenía doce años. Se juntaron, sorprendidos por lo mucho que tenían en común, amaban la misma música, los mismos sonidos, las mismas bases de electrohouse, con sonidos funk y orientación rock. Firmaron en 2008 con Southern Fried Records de Fatboy Slim, y publicaron “Knobbers”, su primer EP, al que siguieron “Mad Kidz” y “E.P.istola”. A partir de entonces se dedicaron a realizar remixes que llegaron muy alto, como el “Day ‘n Nite” de Kid Cudi, número dos en las listas inglesas en 2008. Después, no se quedaron atrás con su versión del temazo “The way I are” del americano Timbaland, que incluyeron en el “live” que hicieron para la radio del videojuego “Grand Theft Auto: The Ballad of gay Tony”. En el 2009 remezclaron el tema “Animal” de los suecos Miike Snow, uno de los grupos del año desde mi punto de vista, con el que luego han colaborado en “Remedy”. Éste último forma parte de su primer álbum “Tons of Friends” (marzo 2010), en el que han colaborado artistas de todo tipo , desde Will.i.am de Black Eyed Peas, Yelle (“A cause des garçons” himno del tecktnik), a Roisin Murphy (componente de Moloko). 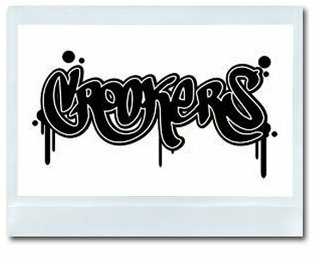 What to tell you of Crookers, that u don`t still know?…We are in the snap of the electrooo, beginning of the genre tecktonik in France, and beginning of the boom of the mode of the cap of plane visor by the non still rappers. I present them to you. They are Phra and Bot. Both started so young to play the guitar, and already when their adolescence came, they were praised by the “synths”. Phra, became well-known in the Italian hip-hop scene, when he was only twelve years old. There were joined, surprised by things that they had in common, they loved the same music, the same sounds, the same bases of electrohouse, with funk sounds and rock orientation. They signed in 2008 woth Southern Fried Records of Fatboy Slim, and published “Knobbers” his first EP, and then “Mad Kidz” and “E.P.istola” followed it. From then they worked realizing remixes that came very highly, as the “Day ‘ n Nite” of Kid Cudi, number two in the English lists in 2008. Later, they did not remain behind with his version of the hit “The way We are” of the American Timbaland, that they included in the “live” that they did for the radio of the videogame “Grand Theft Auto: The Ballad of Gay Tony”. In 2009 they remixed the hit “Animal” of the swedishes Miike Snow, one of the groups of the year from my point of view with which then they have collaborated in “Remedy”. The last one forms a part of their first album “Tons of Friends” (March, 2010), in which artists of all kinds have collaborated, from Will.i.am of The Black Eyed Peas, Yelle (“A cause des garçons” anthem of the tecktonik), to Roisin Murphy (Moloko’s component). Precisamente, éste último, Further, fue lanzado al mercado el día 7 de éste mes y, trece días más tarde, su disco se vende ya en la mayoría de países (incluido España). Ellos mismos aseguran que éste disco es un experimento que “va más allá de todos sus conceptos anteriores”, y por ello decidieron llamarle Further (“más allá”). Asimismo, creen que su música no es música experimental sin más, ya que ellos siempre han tratado de establecer un vínculo con su público, de transmitir sensaciones. Es un álbum de sintetizador brutalista, donde la tecnología cobra importancia, a la vez que se mezcla con sonidos más o menos cotidianos o, digamos, naturales como el relincho de un caballo. Pasando desde un inicio de casi, casi, acid house, por la electrónica, el techno y la psicodelia. “Further”, concebido como una sesión continua de casi una hora, incorpora como novedad el hecho de que cada uno de los ocho temas tendrá su propio video. No es una novedad en su estilo, ya que ellos siempre se han caracterizado por un directo audiovisual impresionante, pero en “Further” han decidido tratar de conseguir ese doble efecto (audio y video) dentro de un mismo álbum. Para ello, han contado con la colaboración de Adam Smith y Marcus Lyall quienes, aparte de haber colaborado con “The Chemical Brothers” en la puesta en escena de muchos conciertos, también han trabajado con U2, Oasis o los mismísimos Rolling Stones (Marcus participó en el “Licks” Tour en los años 2002-03). Además Adam ha colaborado en series televisivas como la nueva “Dr. Who”. Comienza con la engañosa “Snow”, un tema lento (que a mi, personalmente, me recuerda mucho a Goldfrapp) y que poco tiene que ver con el giro radical que se va introduciendo con “Escape Velocity”. La experimentación con los sonidos se nota ya en éste primer cambio y continuará hasta el final del disco. Es el verdadero despegar del disco, incorporando no sólo los característicos sonidos electrónicos, sino además subiendo progresivamente de tono a lo largo de sus doce minutos. Colocándote, por momentos, en puntos de euforia y donde realmente demuestran que son capaces de transmitir esas emociones que ellos demandaban. “K+D+B” es, creo, la única canción que mantiene un ritmo constante a lo largo de la misma. Es melódica y para mí es el punto fuerte para los amantes de ese lado psicodélico de estos característicos “hermanos”. Para cerrar “Wonders of Deep”, una canción que, pese a ser parte de esa sesión continua, se encierra sobre si misma, creando un ámbito diferente y separado de todo lo demás. Una canción que para mí muestra, según transcurren los segundos, una evolución del rock alternativo de Bush o de U2, para meterse de lleno en el ámbito sintetizado y electro. Una gran culminación para un gran disco. Con muy pocas importancia en él para las vocales, “Further” se centra completamente en los sonidos, regresando a lo que siempre han sido, un grupo de música electrónica y alejándose de aquellos que les acusaban de haberse vuelto demasiado “Indies”. It´s been fifteen years since Tom Rowlands and Ed Simons changed their original name “The Dust Brothers” to “The Chemical Brothers”. Pioneers, like another groups as “The Prodigy”, in the Big Beat gender, their works´ styles had gone from acid house, hip (trip) hop, or funk to psychedelic music, and above all, electro music as the basic style. The last album, Further, released on 7th June, and thirteen days after, it´s being sold at most of the countries (Spain included). 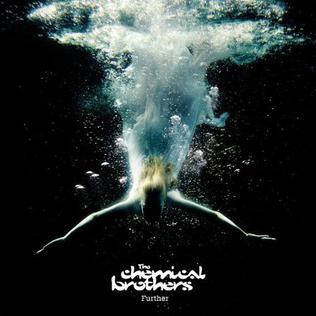 Chemical Bros. themselves, assure that this album is an experiment that “goes further than all their previous concepts”, and that´s the reason why they decided to call it “Further”. They also think that their work is not only experimental music, as they always try to set up a link with their listeners, they try to transmit sensations. Further, is a brutalist synthesizer album, where technology becomes important at the same time that it´s mixed with quotidian (let´s say natural) sounds as a horse neighing. It begins with an almost acid house style, and goes through electro, techno and psychodelia. “Further is conceived as a continued session of near an hour. As new thing, each of the songs will have it´s own video. This is not new on them, as they have been always characterized by their awsome audio-visual lives. In “Further” they´ve tried to mix this double effect (audio and video) inside the same album. For this, they had the colaboration of Adam Smith and Marcus Lyall who, aside from his multiples “Chemical” concerts´ colaborations, had worked with U2, Oasis or Rolling Stones (Marcus patricipated on the “Licks” Tour in 2002). Adam had worked in Tv series like the new “Dr. Who”. The album begins with the misleading “Snow”, a very slow song (that seems like Goldfrapp for me) and which is not very similar with the radical transformation that is introduced with “Escape Velociity”. Sound experimentation is now very clear in this first change, and will be continous until the album´s end. This is the real takeoff, builded in their characteristic electro sounds, and growing up progreesively over its twelve minutes. At some points, it makes you feel euphoric, demonstrating us that they are capables of transmiting those emotions they wanted. “K+D+B” is, i think, the only song that conserve it´s rhythm all along it´s duration. It´s very melodic, and i think it will be the favourite song for those who loves their psychedelic side. The album ende with “Wonders of Deep”, a song which becomes whithdrawn into itself, creating a different and separated sphere, as “Snow” did. It like to imagine some kind of music evolution from the alternative rock of Bush or U2, to the synthetic and electro kind. A great end for a great album. Vocals are not very important in “Further” which concentrates completely on sounds. Chemical Brothers get back to what they have always be, an electro group, shutting up those voices that says they´re becoming very “indie”. This work won´t disappoint Chemical Brothers´ fans. It´s and experiment, but without resigning to the electric, psychedelic, synthesized and euphoric sounds. They had demostrated that, with their experience and genius, they can´t fail. And they had demostrated that “Further” is, as they said, the culmination of “two psychedelic exploration decades”. Si quieres contactar con alguno de los autores del blog, envía un mail a la siguiente dirección. Indica su nombre de autor en el Asunto. If you want to contact with any of the blog´s author, send an e-mail to the next adress. Tell us his author name in the subject. Electro Waveform by Electro Waveform is licensed under a Creative Commons Reconocimiento-No comercial-Sin obras derivadas 3.0 Unported License. Based on a work at www.electrowaveform.wordpress.com.